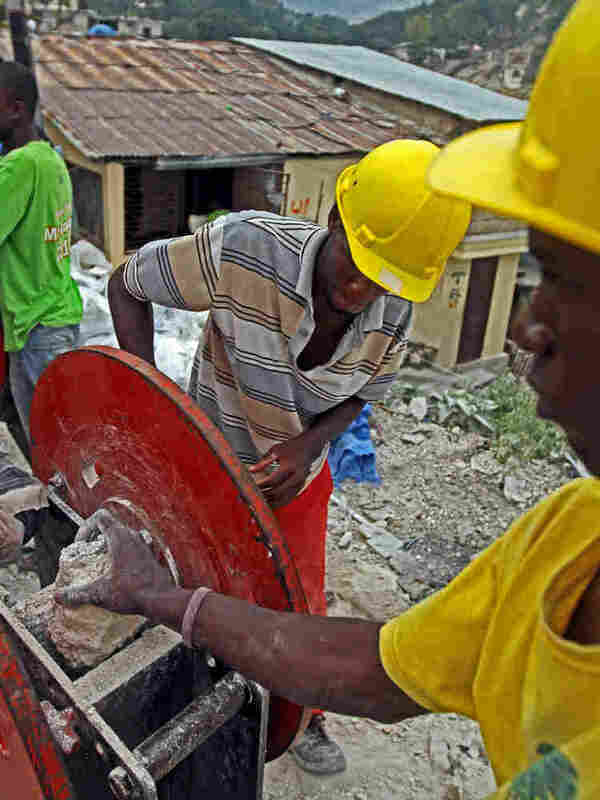 Haitians Take Rubble Removal Into Own Hands One of the biggest stumbling blocks to rebuilding in Haiti is removing the tons of rubble left after the devastating earthquake. Bulldozers can't reach some of the country's dense hillside communities, so residents are using hand-cranked crushing machines to collect and remove debris. More than 1 million Haitians still live in temporary housing, and much rubble remains to be cleared. Two men crank a rubble crusher while one man drops rock-size debris between the metal plated crushers. It's hard work, says Amos Laguerre (center), who makes about $5 a day. 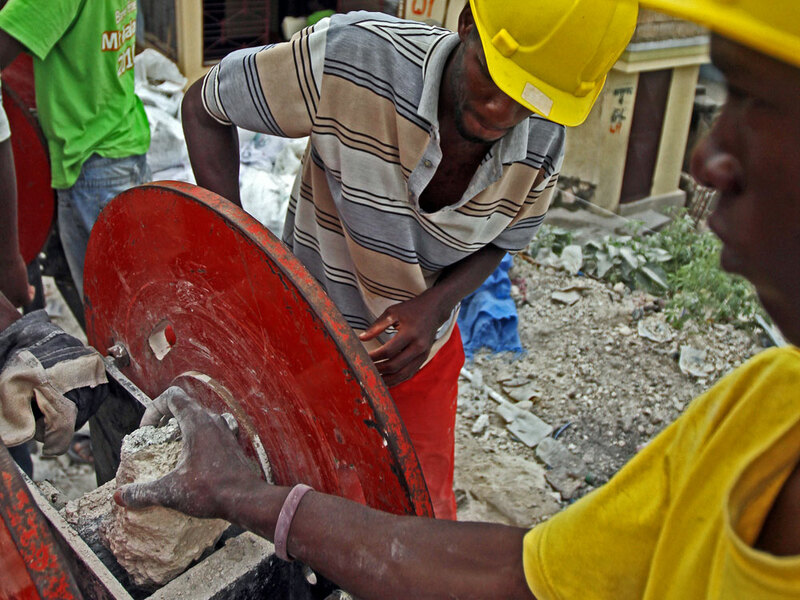 One of the biggest stumbling blocks to rebuilding Haiti is removing the tons of rubble left after the devastating earthquake. Whole neighborhoods remain choked with debris, and residents cannot even begin rebuilding until it's removed. Some residents aren't waiting for the government to do it: They're clearing the rubble themselves. To reach many of Port-au-Prince's hillside neighborhoods, you have to walk up steep, narrow pathways. In the community of Delmas 62, which clings to the capital's hills, passages are so narrow your arms must stay straight by your sides. Conversations waft out of open windows. It's estimated that 20 million cubic feet of debris was created by the quake, but only about 5 percent of it has been cleared. In Delmas, hundreds of two- and three-story homes were destroyed. There's no way a bulldozer can get in. But with the help of Catholic Relief Services, residents in the dense hillside community are using hand-cranked machines to crush and clear the rubble. The charity's Niek Goethe says 15 machines imported from Swaziland are now in Haiti, and another 32 are on their way. "It's such an appropriate solution for Haiti," he says. "Imagine getting heavy equipment down the road there. This is what you need, or these houses are going to be here 10 to 20 years from now." It takes three men to get the job done; two crank the handles, while the third drops boulder-size debris between the metal crushers. Singing helps the men get through the mind-numbing labor. The crumbled rubble is collected in buckets. Sand and gravel are separated into plastic bags. On a good day, the crew fills 125 bags, about 5 cubic meters. No one says this is a solution to the city's rubble problem, but it is making a difference in small neighborhoods like Delmas 62. The bags of recycled rubble are mixed with cement and poured to make the foundations of temporary wooden shelters CRS gives to residents. Soly Santhea and her family are living in one of the shelters in the same spot where their two-story house collapsed. It took them weeks to clear the rubble, but they had no other option. Her mother, father and two siblings were living in a nearby tent encampment, but a few months ago, the owner of the land evicted everyone. "We never even dreamed of coming back here," she says. "Everything was so destroyed. You couldn't even get into the neighborhood." Santhea says she went to the CRS office over and over again, and staff finally came up with the idea to bring in the hand-cranked rubble crusher. Her mother, Ferdilia Escane, says if it weren't for Santhea, dozens of families wouldn't have been able to clear their lots and come back home. "She was key in getting our neighborhood cleaned up," she says. "It's not just me saying this; everyone here knows what she did. She got us organized, got us help. And she is just a girl. I am so proud of her." 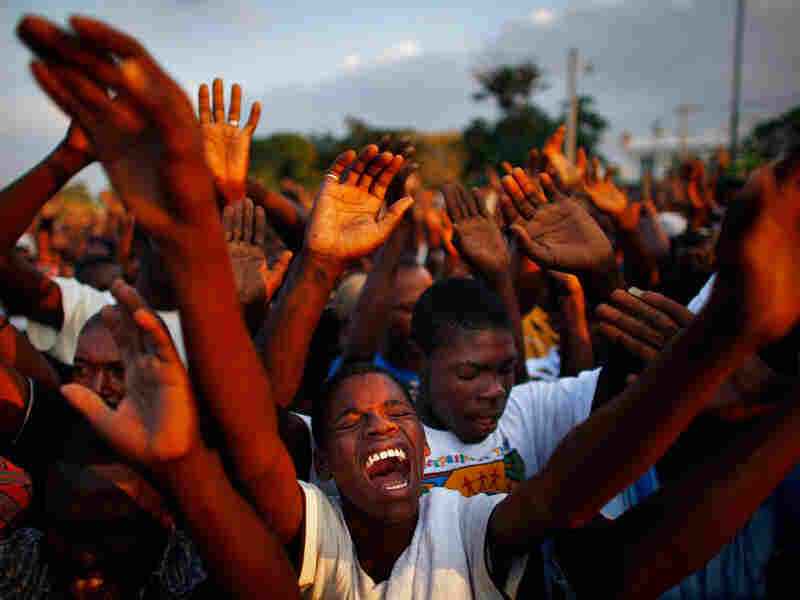 Catholic Relief Services says it hopes to build 8,000 sturdier shelters throughout Port-au-Prince by April. It says it might reach that goal even soon -- depending on how fast the hand crushers crush.